Just a continuation of my admiration of useful changelogs in the iOS App Store. 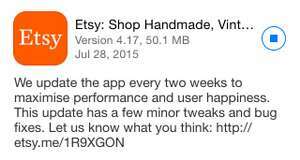 Etsy's latest release promises to maximise my happiness. I wonder if I have to be using their app to be happy, or if it'll increase it with a background update.